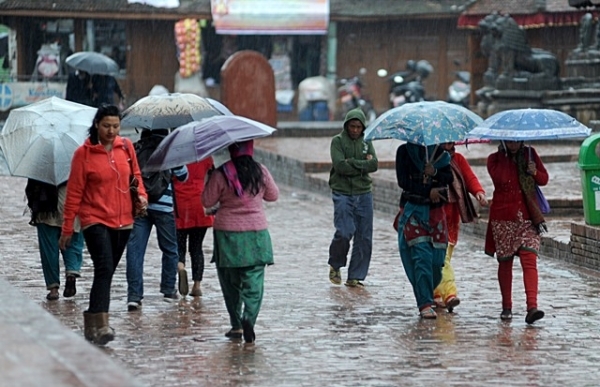 Kathmandu, 7 February : Most parts of the country have received rain and snowfall due to the influence of the westerly wind that entered via far-West region. The weather system that entered into Nepal from Jammu Kashmir has spread its influence from the west to the eastern part, shared the Weather Forecasting Division. Most parts of the country would receive light and moderate rain up to Saturday while some parts are likely to receive heavy rain and snowfall. Barun Poudel, meteorologist at the division, said there has been Weatherly influence in the western part since Wednesday afternoon and it has arrived Kathmandu this morning. “With this influence, the western part of Kathmandu is receiving rain right at the moment”, he informed. It is spreading to the eastern region so there will be rain in the east today, he said, adding such situation would prevail for three days. The Himalayan region is likely to receive heavy snowfall. “There might be snowfall in the western Himalayan region since this morning. The high-altitude areas around Kathmandu including Fulchowki, Daman and Chandragiri are likely to witness light snowfall on Friday”, Poudel informed.